Unveiled in Texas, at the Houston Auto Show. Having breezed through the Dallas Auto Show with some new Laramie Longhorn options, Ram has headed south to the Houston Auto Show, to offer Texans fresh options for the Ram 1500 Rebel and Ram Limited. For 2017, Ram has added a new color option for the 1500 offroader that it’s calling Delmonico Red. The meaty shade of red expands the current six-color range to seven, with the alternatives including: Bright Silver Metallic, Bright White, Brilliant Black, Flame Red, Granite Crystal Metallic and Mojave Sand. Ram Limited models will also now be available with body-colored R-A-M letters and side steps in replace of the standard chrome. “Truck buyers are looking for new colors and features that make a statement and allow them to stand out from the crowd,” said Mike Manley, Head of Ram Truck, FCA – Global. “Whether it’s the off-road enthusiast appeal of the Ram 1500 Rebel or the luxury and sophistication of the Ram Limited, Ram trucks deliver features and durability that are winning over more and more owners.” The no-charge addition of the new deep red exterior hue is available in all Rebel models, as either a monotone finish or as part of a two-tone (with black lower panels) treatment. The Ram 1500 Rebel Delmonico Red can also be ordered with the Rebel Black styling package that adds black wheels and front skid plate. Contrasting with the red exterior is a black and gray interior with black anodized bezels on the door, center console, instrument panel and gauge cluster trim rings. Black heated seats feature grey stitching and “Rebel” embroidery. Ram has priced the monochromatic R-A-M tailgate letters and cab-length running boards at $195 each, offering an alternative look from the bright chrome that was introduced last year. 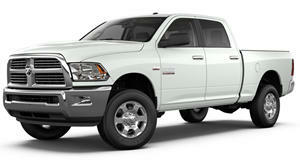 The Ram 1500 Night edition is also now available with body-colored running boards.